The Story in Paintings: Remembering a great general? Anton Petter (1781-1858), Socrates reproaching Alcibiades (date not known), oil on canvas, dimensions and location not known. Wikimedia Commons. Few of us get to write our own obituary, or to determine how we might be remembered in paintings. If you’re a major statesman and general, who commands many thousands of words on Wikipedia, you might hope for paintings showing you leading in battle, or in political debate. But for Alcibiades, that is not the case. Alcibiades (c 450-404 BCE) was born in Athens, and served as an influential statesman, military advisor, and general in Athens, Sparta, and Persia. He had a particularly close relationship with his teacher Socrates, who has an even greater reputation as a philosopher. He enjoyed spectacular military successes in the Battles of Abydos and Cyzicus, but following defeat at Notium, he went into exile in Phrygia, where he died. 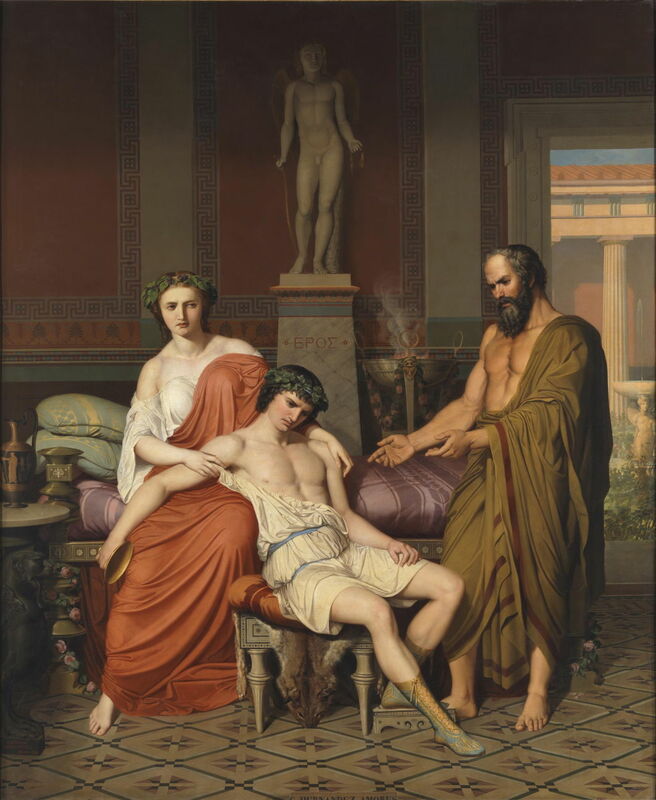 For reasons that are not clear to me, Alcibiades became a popular figure in history paintings during the period 1750-1900, across much of Europe. Jean-Charles Nicaise Perrin (1754–1831) (attr) or Joseph-Marie Vien (1716–1809) (school of), The Wounded Alcibiades (1743-1800), oil on canvas, 53.5 × 90.5 cm, Wellcome Library (Bequeathed by Henry Solomon Wellcome 1936), London. By courtesy of the Wellcome Library, via Wikimedia Commons. The Wounded Alcibiades, painted between 1743-1800 either by Jean-Charles Nicaise Perrin or one of Joseph-Marie Vien’s school, seems to be the kindest visual epitaph. A military surgeon is operating on a wound on Alcibiades’ abdomen, sustained in the course of battle. At the far right, the much older figure of Socrates stands and watches his friend and pupil undergo this procedure without anaesthetic of any kind. This surgery takes place in Alcibiades’ tent, with his helmet, shield, and weapons visible in the upper centre. A small group of his commanders watch from the left, and two women gaze on from the foot of the general’s bed. 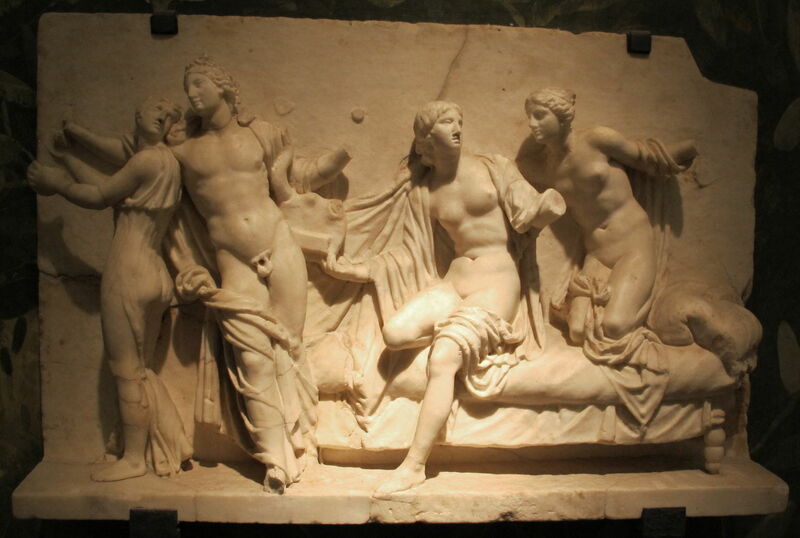 Artist not known, Alcibiades and the Courtesans (date not known), marble relief, dimensions not known, Collezione Farnese, Museo Archeologico Nazionale di Napoli, Naples. Image by Sailko, via Wikimedia Commons. Less flattering, perhaps, is this marble relief kept in the Museo Archeologico Nazionale di Napoli, most probably showing Alcibiades and the Courtesans, although it had earlier been thought to be of Apollo and three nymphs. Why, I wondered, was this great general being remembered by an incident from the more personal side of his personal life? 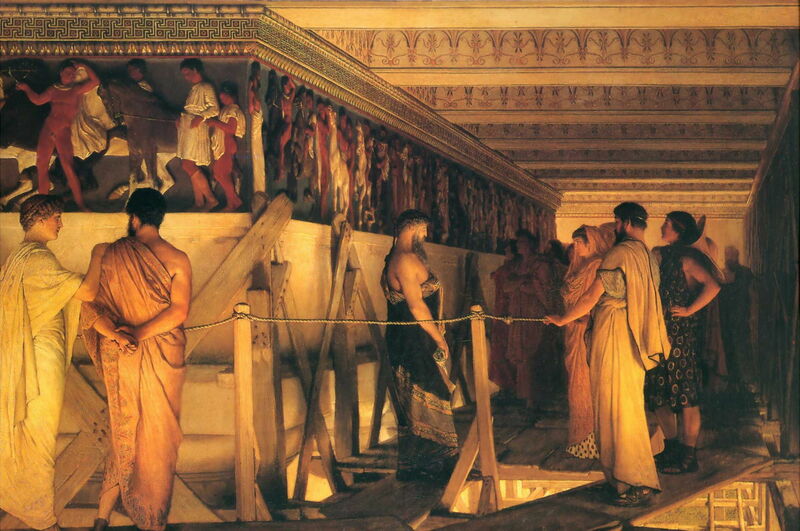 Lawrence Alma-Tadema (1836–1912), Phidias Showing the Frieze of the Parthenon to his Friends (1868), oil on canvas, 72 × 110.5 cm, Birmingham Museum and Art Gallery, Birmingham, England. Wikimedia Commons. Lawrence Alma-Tadema’s beautiful painting of Phidias Showing the Frieze of the Parthenon to his Friends (1868) includes a portrait of Alcibiades: he is the decidedly effeminate young man at the far left, gazing intently at Socrates, who has his back to the viewer. Christoffer Wilhelm Eckersberg (1783–1853), Socrates and Alcibiades (date not known), oil on canvas, 32.7 x 24.1 cm, Thorvaldsens Museum, København, Denmark. Wikimedia Commons. 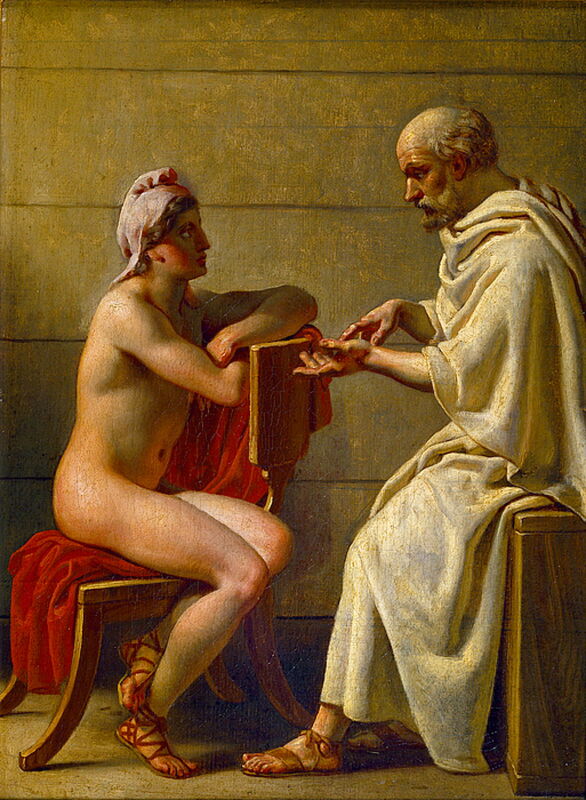 The father of Danish painting, Christoffer Wilhelm Eckersberg, is even more explicit in his portrayal of their relationship in his Socrates and Alcibiades. But this still doesn’t provide any explanation for the marble relief. Jean-Baptiste Regnault (1754–1829), Socrates Tears Alcibiades from the Embrace of Sensual Pleasure (1791), oil on canvas, 46 x 68 cm, Musée du Louvre, Paris. Wikimedia Commons. That comes in a succession of paintings, starting with Jean-Baptiste Regnault’s Socrates Tears Alcibiades from the Embrace of Sensual Pleasure in 1791. It then becomes clear that Alcibiades had a colourful life not just in politics and the battlefield, but in the beds of many women too. The story is that the young Alcibiades was wayward, and started to consort with courtesans. 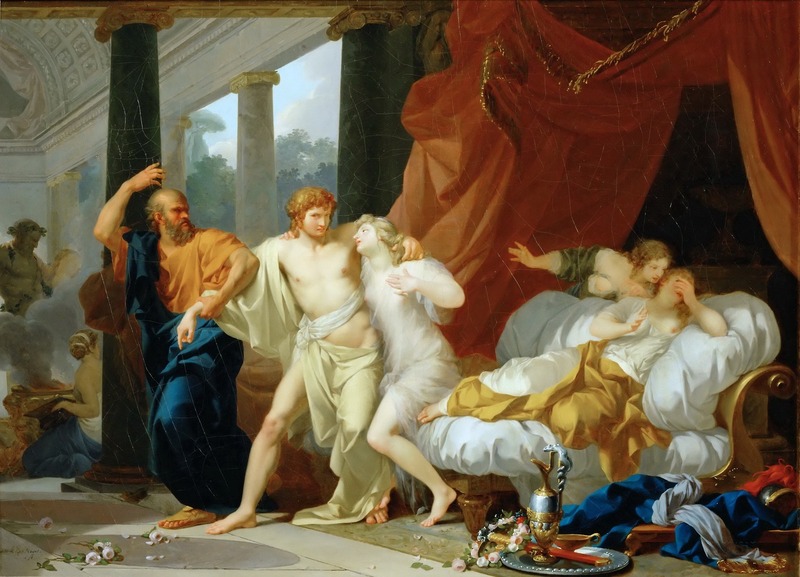 Discovering this, his teacher (and, apparently, lover) Socrates tracked him down one day in a brothel, and dragged him away from the clutches of its women – seemingly to their great disappointment. Anton Petter’s Socrates reproaching Alcibiades tells the same sorry story. 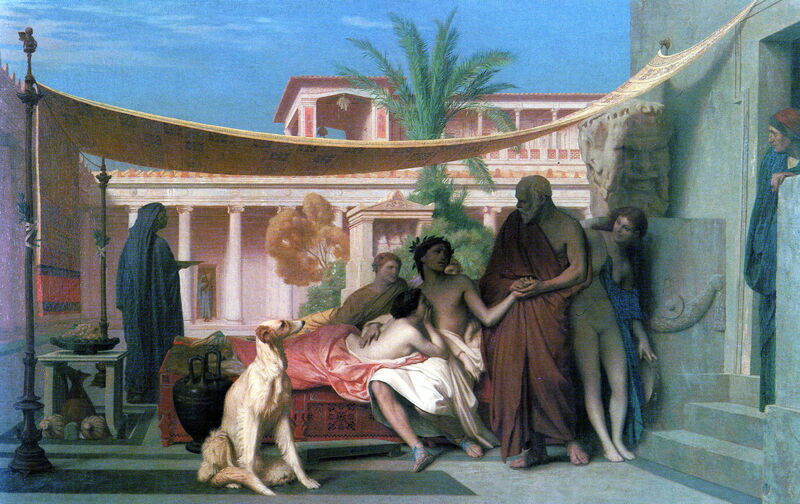 Germán Hernández Amores (1823/27-1894), Socrates Chiding Alcibiades in Home of a Courtesan (1857), oil, dimensions not known, Museo Nacional del Prado, Madrid. Wikimedia Commons. So does Germán Hernández Amores’ Socrates Chiding Alcibiades in the Home of a Courtesan from 1857. Jean-Léon Gérôme (1824-1904), Socrates seeking Alcibiades in the house of Aspasia (1861), oil, dimensions and location not known. Wikimedia Commons. Jean-Léon Gérôme even identifies whose house he was dragged from, in his Socrates seeking Alcibiades in the house of Aspasia (1861). That’s not all. If Plutarch is to be believed, Alcibiades’ wife, Hipparete, was sufficiently troubled by his repeated visits to courtesans as to start divorce proceedings against him. But her husband turned up at the court and dragged her away, ending the case. Louis-Jean-François Lagrenée (1724–1805), Alcibiades on his Knees Before his Mistress (c 1781), oil, dimensions and location not known. Wikimedia Commons. 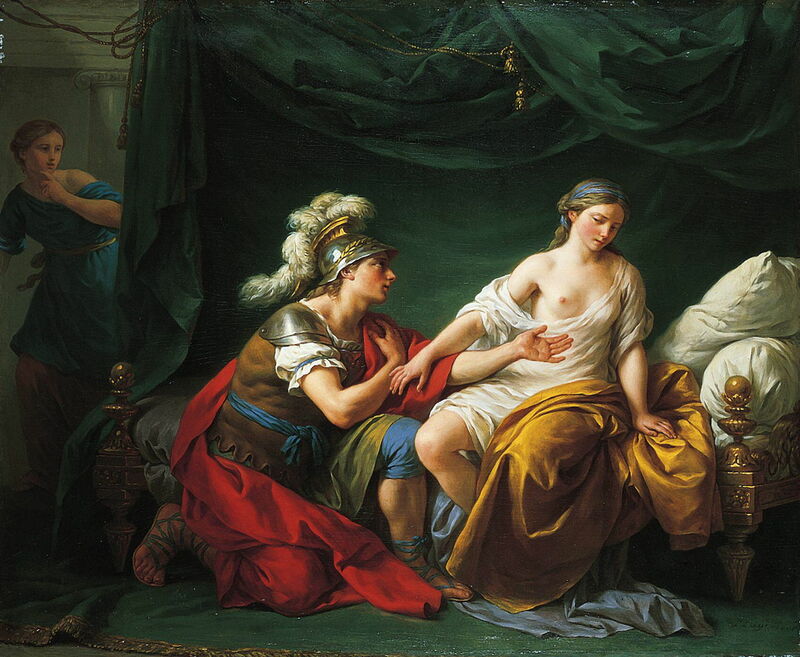 Louis-Jean-François Lagrenée’s Alcibiades on his Knees Before his Mistress (c 1781) shows him with two women, neither of whom appears to be impressed by his behaviour. What goes around, comes around, whether on the battlefield or in the bedroom. When he had made sufficient enemies as to make life in Greece untenable, and fled to exile in Phrygia – today’s western Turkey – he settled down to life with another mistress, Timandra. Opinions are divided as to whether his death was the result of a Spartan mission, sent to settle old scores, or Timandra’s relatives. Either way, a hostile group surrounded his villa and set alight to it when he was inside. Alcibiades was forced to escape, and once his enemies got him in their sights, they loosed their arrows and killed him. 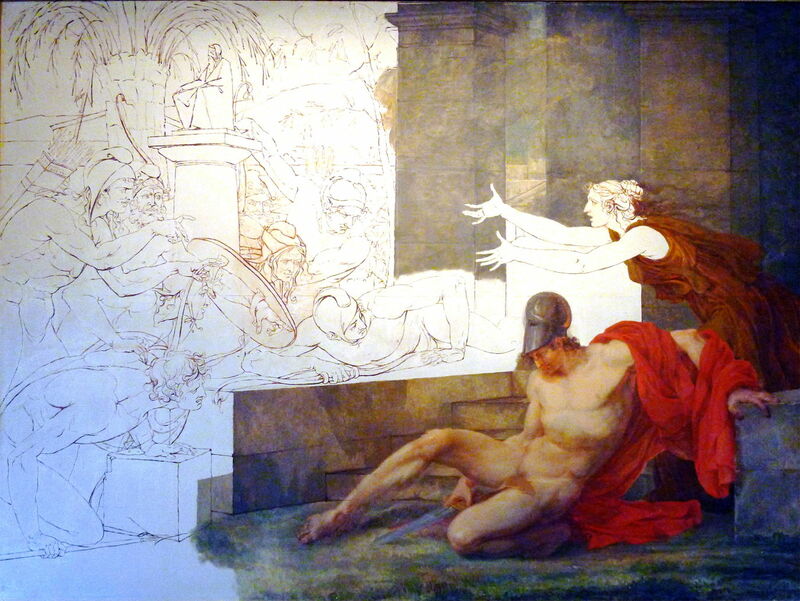 Jacques Réattu (1760–1833) The Death of Alcibiades (date not known), oil, dimensions not known, Musée Réattu, Arles, France. Wikimedia Commons. Jacques Réattu’s The Death of Alcibiades is sadly unfinished, but I think gives a clear idea of his composition and intent. Alcibiades is slumped behind a low wall, his attackers massed on the other side. Timandra is remonstrating with the group, which suggests that Réattu thought that they were her relatives, not a Spartan hit-squad. 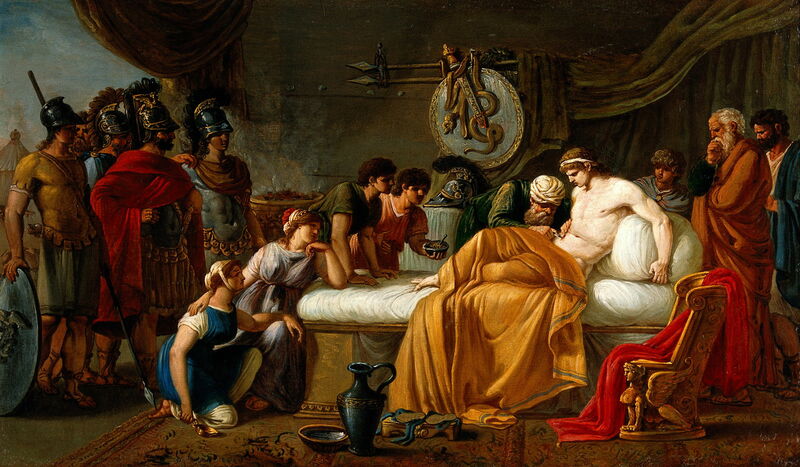 Michele De Napoli (1808-1892), The Death of Alcibiades (1839), oil, dimensions not known, Museo di Capodimonte, Naples. Wikimedia Commons. 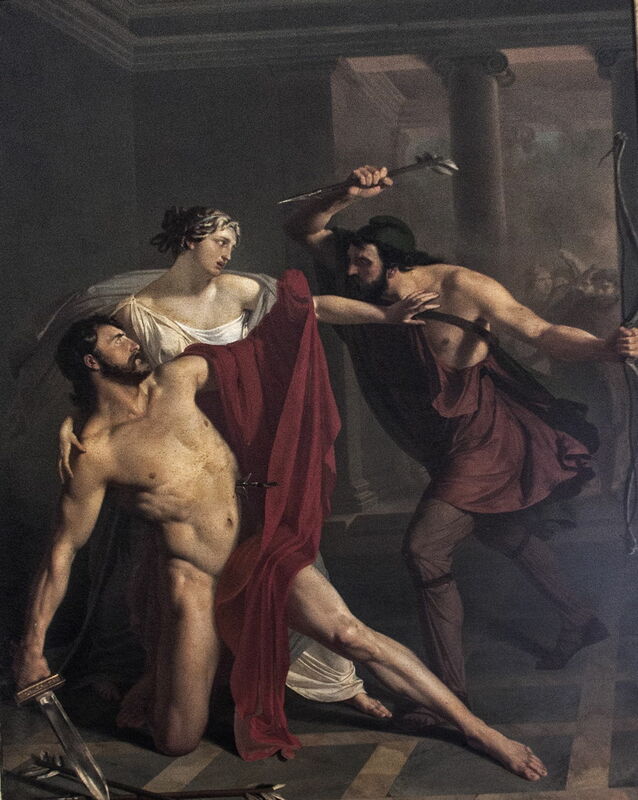 Michele De Napoli’s The Death of Alcibiades (1839) shows his mistress trying to fend off a close assault, but it is already too late, as an arrow has run deep into his upper abdomen, and his legs are giving way. Smoke shrouds the other attackers in the room behind. I didn’t know who Alcibiades was, and now I can see two quite different people: the statesman and general detailed on Wikipedia, and a very different figure in these works of art. Either way, they confirm that those who live by the sword, die by the sword, but are best-remembered in the bedroom. Posted in General, Painting and tagged Alma-Tadema, Amores, Eckersberg, Gérôme, narrative, painting, Petter, Réattu, Regnault. Bookmark the permalink. Thank you, I had been looking for an explanation.